Audience: This children’s picture book would be enjoyed by young children ages 3-8 for the animal characters, the simple vocabulary, and the uncomplicated storyline. Summary: Turtle is zipping through town and his neighbors want to know where he is headed and why. Turtle is so intent on reaching his destination that when his first neighbor, Mrs. Raccoon, asks him where he is going, he does not even stop walking as he replies that he is “off to see something red, red, red.” When Mrs. Raccoon guesses that he must be in a hurry to see her red roses, Turtle tells her that’s not it, so she follows behind him to find out exactly what the red thing could be that he is rushing off to see. Although every neighbor he passes asks where he is headed, Turtle will not say, so they join along to follow him all the way through town until the red, red, red surprise is revealed…..a radiant red sunset. Literary Elements at work in the story: Red, Red, Red is a sweet story set in an idyllic small town populated by hardworking forest and farm animals. The soothing watercolor and pen illustrations create a detailed picture of a close-knit community that is curious and concerned about its fellow citizens, with extra attention drawn to all things red, red, red. The author has given Turtle a determined personality who cannot be swayed from his mission, yet he is trustworthy enough for his neighbors to follow him. 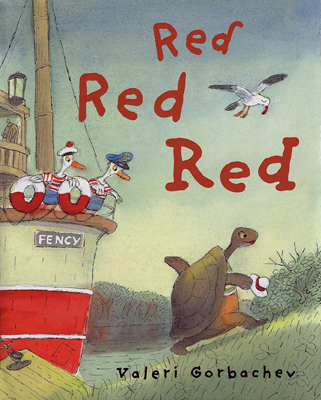 The repetitive dialogue engages the reader to join along with Turtle until the moment his neighbors are rewarded for their journey with the surprise red, red, red ending. How does the perspective on Gender/Race/Culture/Economic Stability make a difference to the story? The various creatures in Red, Red, Red live in the same town, have very different jobs and responsibilities, yet all function together in a loving community. Although the difference in species is not discussed, the author celebrates their unique gifts as they are portrayed in vocations that are worthy and necessary to every individual and to the community as a whole. All are willing to stop their work and leave it behind as they pursue the question of where Turtle is headed. It is interesting that the author chooses a Turtle as the lead character who is on a long walk to his destination. Although turtles are known to be one of the slowest animals, this particular turtle is “rushing” through town gathering many followers. A parallel can be drawn to our busy lives and the need to slow down, celebrate our time together, and take the time to stop for a sunset every now and then. Theological Conversation Partners: Red, Red, Red may be a simple tale, but it is rich in themes related to our Christian life: our decision to stop what we are doing and follow Jesus, trusting that He knows the right path, and, ultimately, being rewarded for our trust. Red, Red, Red also reminds us that sometimes we must stop, rest and enjoy God’s creation as a community. Although Turtle does not ask his neighbors to join him, each one is willing to trust his guidance and lay aside their work to do so. A wonderful comparison can be drawn to Luke 5: 1-11, and how the first disciples were willing to drop their individual lines of work to follow Jesus: not because they knew where Jesus was leading them, but because they trusted Him despite their lack of knowledge. Like Jesus, Turtle only gives hints about their destination as he goes along, and lets suspense build as their journey unfolds. Much like the disciples, there is a point where Turtle’s friends become frustrated with the long walk and cannot see why they decided to follow. Only then does Turtle pronounce that it is finally coming. The verse “Be still and know that I am God” rings true as all of Turtle’s followers sigh happily as they watch the beautiful sunset. Imagine what they would have missed if they hadn’t “put their nets down” and followed. Share with the group why you feel that the author chose a Turtle as the lead character in a story about a long walk? What do you think is the author’s purpose in selecting a notoriously slow creature as the lead character in this story? Why do you feel that Turtle did not tell the neighbors where they were going or what they were going to see? What made each animal want to follow Turtle? Discuss the parallels between the characters in the story and the first disciples and their choice to stop their work to follow Jesus? Why is it important that the characters in the story are all different species of animal? What does this tell us about what God wants for our us in the world? What do you think the animals were thinking when they reached the hill and did not see anything red, red, red? Describe what the disciples must have felt as they watched Jesus in his last days on earth and the feeling of disappointment they may have experienced at the time. Finally, share among the group the ways that we are asked to wait on God for miracles of all sizes. What are ways we can “be still and know that I am God.” How can we set aside time for God and community in a society that celebrates being usy, busy, busy? This review is written by Union Presbyterian Seminary student Allison Tibe. Red Red Red by Storypath is licensed under a Creative Commons Attribution-NonCommercial 4.0 International License.